The Shambles in York claims to be Europe’s oldest shopping street and it’s best known for its period properties that almost touch across the street as the levels go up. The houses here have been lived in for hundreds of years, although they’ve also been places of work for just about as long. Originally they were the homes of butchers who sold their meat from the front room. In fact, that’s where the street gets its name from as it means slaughterhouse or meat market. In ancient times hygiene left something to be desired and the cobbled street down the centre would have had all kinds of animal remnants thrown into it. On some of the properties in the Shambles you can still see the meat hooks outside. 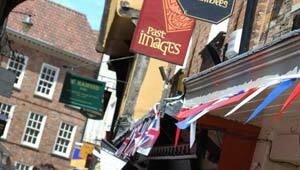 Today the street is packed with traders of all kinds from gift shops to tea rooms. The street often gets busy and it’s tiny, so at peak times don’t expect to be able to stand in the middle of a large crowd taking photos. If you want to stop for tea here, a popular choice is the Earl Grey Tea Rooms where you can sit under the oak beams and sip your tea surrounded by tapestries. Other shops in today’s street include fudge makers, gift shops and jewellery stores.